On this date C.S.A. inaugurated service in and out of Westport, thus giving through service; Wellington-Nelson-Westport-Greymouth-Hokitika and return. Two machines made the trip and a function was held at Westport. The D.H. Dragon Rapides ZK-ACT "Neptune" and ZK-AEC "Mercury" were flown by pilots (Captains) K.R. Johnston and A.T. Orchard. On the Southbound flights, covers were backstamped as follows:- Westport 11.00am, Greymouth 11.30am, and Hokitika 12.15pm, whilst on the Northbound flights, backstamps were:- Westport 1.00pm, Nelson 2.00pm, and Wellington 2.45pm. Mail was also connected with the C.S.A. service to Blenheim on the same day, being posted up to 11.00am at Westport and backstamped at Blenheim at 5.00pm. Westport mail also connected at Wellington with the Union Airways services, being backstamped Palmerston North 4.45pm, Napier 5.30pm, Gisborne 7.30pm, and New Plymouth 8.00pm the same day. It should be noted that the quantity of mail listed under Westport-Wellington included mails for points beyond Wellington so that this figure actually covered the whole of the North Island mail. A small quantity of special covers was used privately on the first day and these bore the C.S.A. crest together with the inscription:- "FIRST OFFICIAL AIR MAIL to and from WESTPORT". This was printed in black. As little publicity was given to the inaugural date of this service, mails were small on all sections, and indeed, on some, were actually rarities the day after the flight. By Cook Strait Airways. Rescheduled as a daily service when it was incorporated into the West Coast route. The aircraft are detailed in the previous entry. Service by Union Airways. Inaugurated with D.H.86 Express ZK-AEH "Korimako" (Commander G.R. White with Second Officer K.A. Brownjohn) on 20 March. The return flight was made on the following day. Overseas Flights: 1939, 13 Apr.-1 May / 1939, 20 May-9 June / 1939, 2-12 June / 1939, 9-11. 12-29 Aug. / 1939, 10-27 Aug. / 1939, 5 Sept. / 1939, 7-10 Sept. / 1939, 24-30 Sept. / 1939, 21-23 Oct.
Last Cook Strait Airways flights on service before wartime requisition of their Dragon Rapide fleet by N.Z. Government. No covers have been identified. Intermittent Air Travel (NZ) Ltd service by arrangement with Cook Strait Airways. As with the last CSA flights, no covers have been identified. A cover has been seen signed by Andrew Fell who, according to the details supplied, landed an aircraft of the "Dunedin Aero Club" on the beach during the celebrations marking the Centennial of the arrival of the brig "Magnet" from Sydney on 16 March, 1840. The cover is postmarked WAIKOUAITI 16MR40.6. We have been unable to confirm this flight at this time. Due to the cancellation of the inter island steamer because of the suspected presence of a German submarine in Cook Strait. Only ordinary surface rate mail was flown on the emergency flights and no official markings were applied but private cachets have been seen on covers flown on 21 June signed by Commander M.C. MacLeod and Second Officer W. Smillie, and Wellington-Christchurch (20-21 June) by Commander K.R. Johnson and Second Officer T.R. Pike. Note that mail bearing the newly issued British Stamp Centenary adhesives arrived in N.Z. at the time of the emergency and some of these letters were flown on the service to the South Island. Only a few identifiable covers now exist. Heavy rain made it advisable for the Union Airways Lockheed Electra ZK-AFD "Kereru" to make an emergency landing at Timaru aerodrome while on a scheduled flight from Christchurch to Dunedin. The aircraft remained at Timaru overnight but passengers and mail were taken by bus to Dunedin. No cachets were applied to mail and no covers have been identified. Air Travel (NZ) Ltd. Stormy conditions prevented the completion of the flight. Mail stamped with boxed AIR SERVICE INTERRUPTED cachet. Of Union Airways Lockheed Electra. The aircraft made an emergency landing at Hawera after encountering bad weather. It returned to Palmerston North where the mail was transferred to the main trunk express train. No cachets were applied. Interrupted flight. When heavy fog obscured the aerodrome at Harewood, Christchurch, Union Airways Lockheed Electra ZK-AGK "Kaka" (Commander A.G. Gerrand) made an emergency landing on New Brighton Beach. Passengers and mail were taken into Christchurch, but were brought back later when ZK-AGK "Kaka" resumed the flight. No cachets applied to mail. Overseas Flights: 1941, 18 July / 1941, 12 Sept.
WESTPORT-NELSON INTERRUPTED FLIGHT OF AIR TRAVEL (N.Z) LTD. 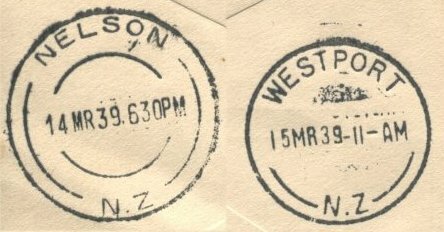 Severe storms in this area of the West Coast of the South Island grounded the aircraft Mails for Nelson and Wellington were stamped with the framed AIR SERVICE INTERRUPTED cachet. Overseas Flights: 1941, 5-10 Nov. / 1941, 11 Nov.
High winds prevented the Air Travel (NZ) Ltd service being flown. Covers were stamped with the framed AIR SERVICE INTERRUPTED cachet in green. CRASH OF UNION AIRWAYS LOCKHEED ELECTRA ZK-AFE "KERERU"
(Commander K.R. Johnston with Second Officer W. Smillie) on a flight from Wellington to Nelson. The aircraft crashed onto Mount Richmond, Marlborough, killing both pilots and the three passengers on board. Fire destroyed the Electra and bags of mail. Overseas Flights: 1942, 2-3 Sept. / 1942, 6 Sept. / 1942, 20 Oct.
After a propeller became detached the aircraft force-landed in the sea 20 minutes after leaving Westport and the four passengers were drowned. The pilot Flight lieutenant A.C. Baines, who was on loan from the RNZAF, survived. CRASH OF UNION AIRWAYS LOCKHEED ELECTRA ZK-AFD "KUAKA"
(Commander A.T. Orchard with Second Officer A.I. Hadfield) while on a scheduled flight from Dunedin to Christchurch and Wellington. "Kuaka" crash-landed on Flagstaff Hill in very poor visibility just after leaving Taieri aerodrome, Dunedin. There were no injuries to passengers and crew and they were able to walk Out. Mails were placed on the next day's flight. No cachets were applied. HOKITIKA-AUCKLAND SERVICE BY AIR TRAVEL (NZ) Ltd.
To connect with Union Airways was interrupted by bad weather. Mail was stamped with the framed AIR SERVICE INTERRUPTER cachet in purple. Was interrupted for some reason. Mail was stamped with the framed AIR SERVICE INTERRUPTED cachet struck in purple. Overseas Flights: 1943, 13 Apr. / 1943, 13 Apr. / 1943, 27 May / 1943, 31 May / 1943, 11-19 June / 1943, 27 July / 1943, 28 Oct.
Lockheed Lodestar service inaugurated by Union Airways with ZK-AHK "Karoro" (Commander J. Nevill Jackson with Second Officer R.O. Chatfield). Some privately printed covers were flown, but mails were very light on some sections. Overseas Flights: 1943, 1 Nov. / 1943, 4 Nov. / 1943, 15 Dec. / 1943, 22 Dec.
Reports that the inter-island steamer express TEV "Rangitira" had come under torpedo attack on the voyage from Lyttelton to Wellington led to the suspension of the service for two days. Mail which had accumulated at Palmerston North from the 28-29 Feb. and Wellington posted on 1 March, was flown to Christchurch on 2 March. Mail held in Christchurch from 1 March were flown north on the return flight. Only ordinary surface rate mail was carried and no distinctive marks were applied. Identification can only be assumed from the postmarks. By the RNZAF and Public Works Department aircraft. Extensive flooding in some areas cut rail and road links and the Post Office requested assistance from the Air Force and the PWD in flying mails between isolated towns. The PWD may have flown their Miles Whitney Straight ZK-AFH. 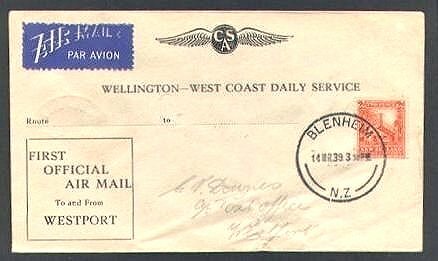 Only surface rate postage was charged and no cachets or special markings were applied but at Wairoa the Postmaster endorsed some covers, as did Flying Officer G.C. Lewis who flew the RNZAF Fox Moth NZ566. Only a few covers have been identified. Piloted by Flight Lieutenant P.C. Lewis on a scheduled flight from Nelson to Westport, the Dragon crashed on Mount Hope near Nelson. Two of the five passengers (Captain J.C. (Bert) Mercer, the Managing Director and founder of the airline, and the Secretary, Mr M. Dawe) were killed. Mails from Auckland and Wellington for Westport, Greymouth, and Hokitika were recovered and forwarded without any cachets or identifying markings. Overseas Flights: 1944, 14 Nov. / 1944, 24 Nov. 1944, 10 Dec.
As a result of the N.Z. Railways and N.Z. Railway Road Services strike in the North Island. The Government ordered the RNZAF to fly passengers and mail over various routes, letters being carried at the ordinary surface rates. No official markings or backstamps were applied to covers but a privately produced cachet reading EMERGENCY STRIKE AIRMAIL in a double lined frame was applied in various colours to identified flown letters after the flights. The RNZAF used a number of different aircraft including Douglas Dakotas, Lockheed Lodestars and Lockheed Hudsons. During the severe South Canterbury-North Otago floods which cut rail and road links. The Air Force conveyed railway passengers and surface rate mail between Christchurch, Oamaru and Dunedin. No special cachet was applied but a small number of covers was privately endorsed and backstamped at Dunedin or Oamaru. Reopened by Union Airways with the rebuilt D.H.86 Express NZ553 hired from the RNZAF. The D.H.86, registered as ZK-AHW "Korimako" flew three daily sections with covers on the first flight backstamped NAPIER 26 MR 45 4PM, GISBORNE 26 MR 45 5-3OPM, AUCKLAND 27 MR 45. 10.3OAM and on the return flight GISBORNE 27 MR 45 5.3OPM, NAPLER 28 MR 4511 AM. and PALMERSTON NORTH 28 MR 452PM. With the opening of the East Coast (N.L) services through Palmerston North connecting with the main trunk route, mails could be flown through to Invercargill on the same day. Some privately printed covers were included in the first mails. The aerodrome, which had been opened in November 1944 was considered unsafe for use during the winter months and covers flown out by Union Airways on this date marked the closure. Overseas Flight: 1945, 23-27 Apr. D.H.89B Dominie pending the post-war resumption of the regular Union Airways service. Overseas Flights: 1945, 17 July / 1945, 5 Aug.
AUCKLAND-PALMERSTON NORTH-WELLINGTON-CHRISTCHURCH & VICE VERSA. Union Airways Lockheed Lodestar service was resumed after wartime suspension. A new Lodestar registered ZK-AHX "Karoro" was introduced. This was the third UAL aircraft to carry this name. A privately produced cachet was struck in various colours on some covers. Only small mails were carried on these flights. Overseas Flight: 1945, 4 Sept.